When the weather hits 90+ and the pool feels more like bath water or a summer storm seems to last for days, I’m looking for indoor activities that are inexpensive, yet entertaining for my kids. Go Bowling! It’s indoors, air-conditioned, entertaining, competitive, and often inexpensive. 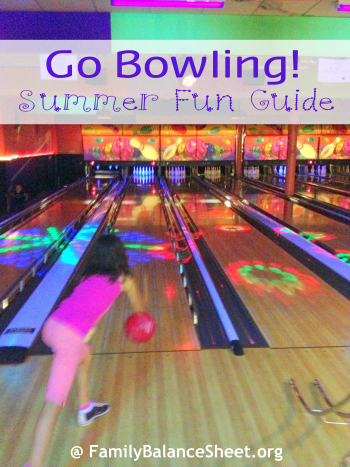 Bowling offers just about everything I’m looking for in an indoor activity. I’ve found coupons in our community’s Bonus book and Clipper magazine for Buy 2 Games, Get 2 FREE. Or check out KidsBowlFree.com and register your kids at a local, participating bowling center to receive certificates to bowl 2 FREE games a day all summer! Shoe rental is not included. It’s indoor fun for those less than desirable days to be outside. Do you go bowling with your family? Let us know in the comments. Bowling is indeed a fun and great activity for the whole family to do! Bowling alleys also usually have really delicious and affordable foods too like pizza and burgers, making it nice to do for a full evening out. Plus, it’s all indoors, so you don’t have to worry as much about allergies and such.